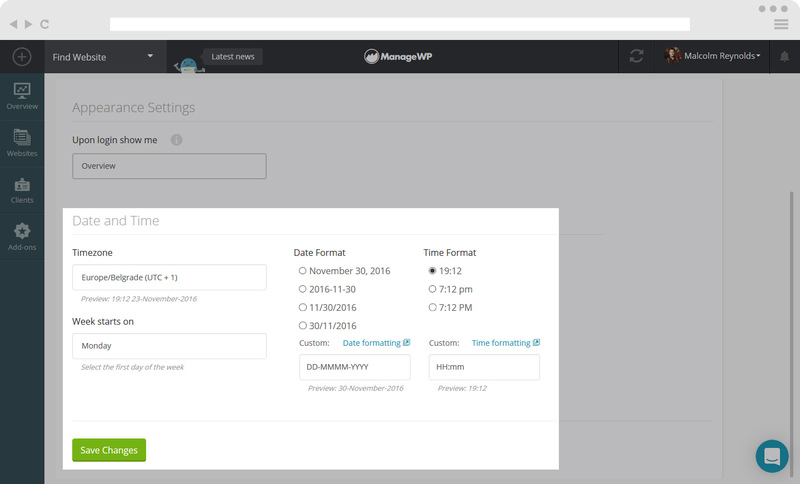 It’s easy to customize ManageWP so that it provides the perfect management tools for your setup. 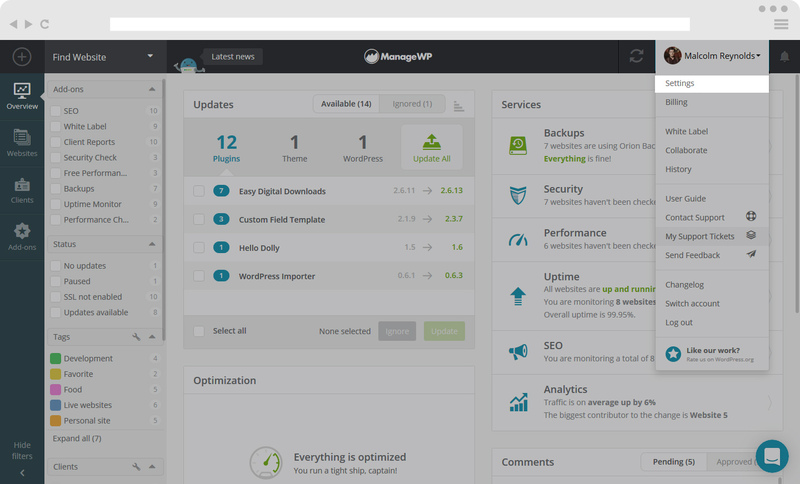 We know that every person’s approach to website management is different, that’s why we’ve provided a whole group of ManageWP settings that you can tweak and change to make sure that ManageWP works for you. 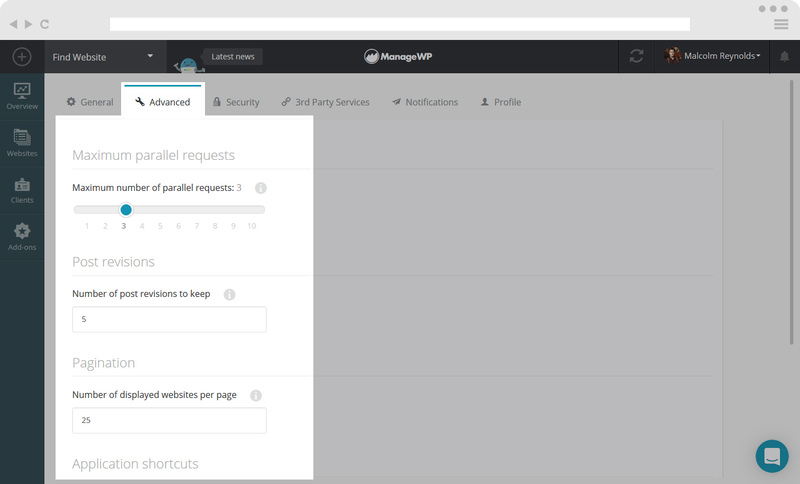 You can change how many posts and comments appear on the dashboard, add additional layers of security and much more! 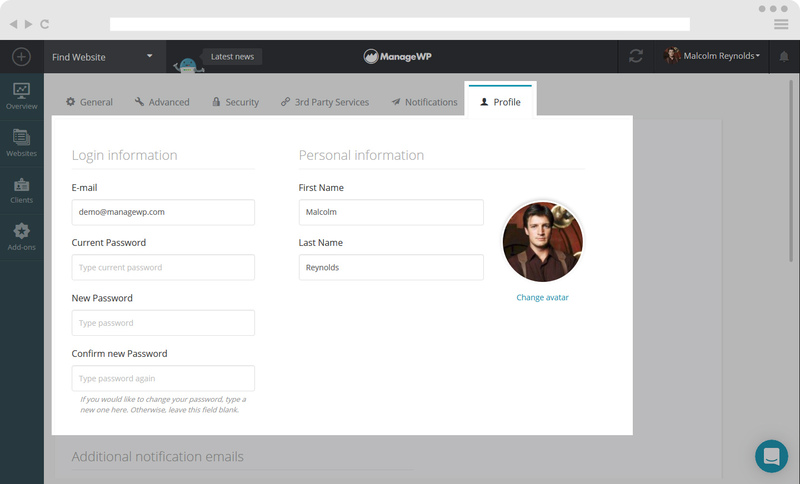 When you log into your ManageWP account, you will see on the top right corner your profile log in details. Click on this and below you will see a set of options. Select Settings. Check the box here if you want your sites to auto-refresh on login. 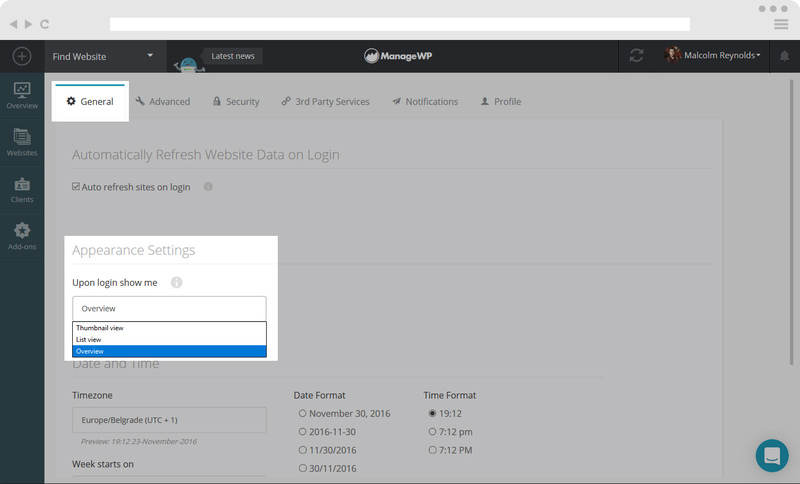 This means that you will not have to click the Sync Icon to refresh your website data when you log into your ManageWP dashboard. 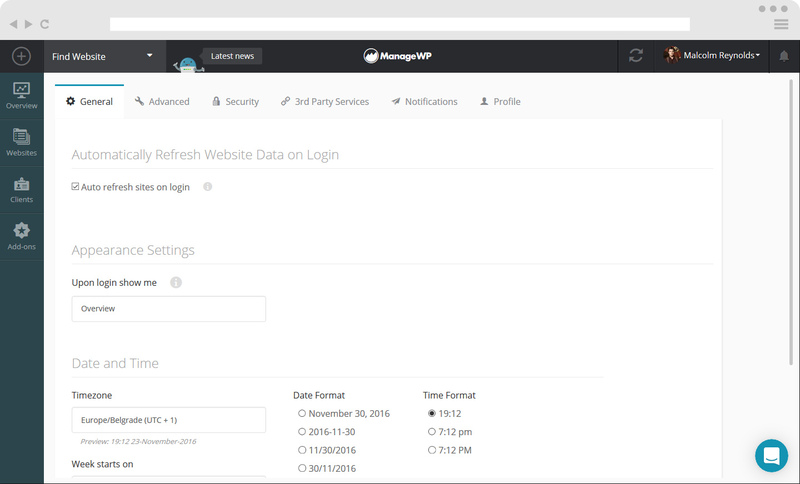 Upon login you can choose what view your ManageWP account will load on. There are three options: Thumbnail view, List view, Dashboard view. In this setting you are able to select in what format you wish to view your date and time settings. You have options to set your timezone, the day your week starts on, as well as time and date format. Set the maximum number of parallel requests per server. More requests usually mean a faster syncing time, but some sites may not load if the server can not handle that many connection (sites will appear in red). Here you can select the amount of Post Revisions you wish to keep per each post when performing the Clean Revisions action. The most recent post revision (depending on the number you choose to keep) will not be displayed nor cleaned inside the Optimization Widget. Here you can set how many websites you want to be displayed per page. Keep in mind that too many websites on one page could slow down the dashboard (50 is recommended). Here you are able to enable your Application Shortcuts. Check the box. 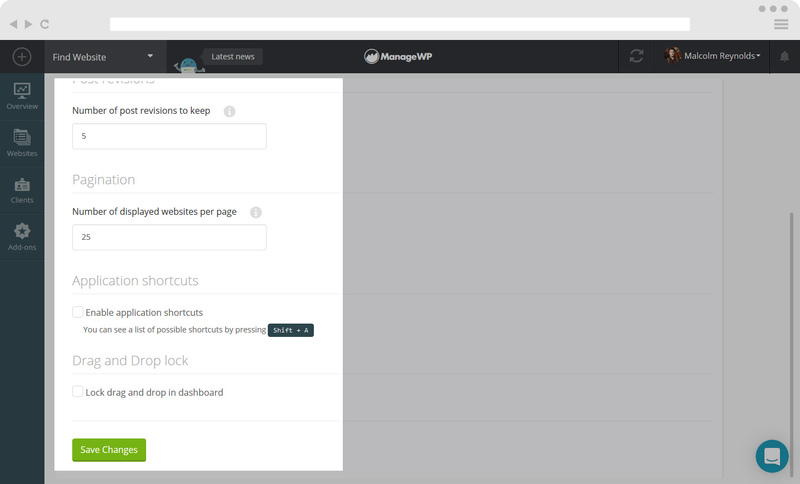 Here you can lock the ability to Drag and Drop Widgets in your Overview tab or Single Site dashboard. For the two factor authentication we use Google Authenticator. You need to install Google Authenticator App on your mobile device. To set up the Google Authenticator, you can either do it by copying the code directly into you phone, or scanning the unique barcode displayed. 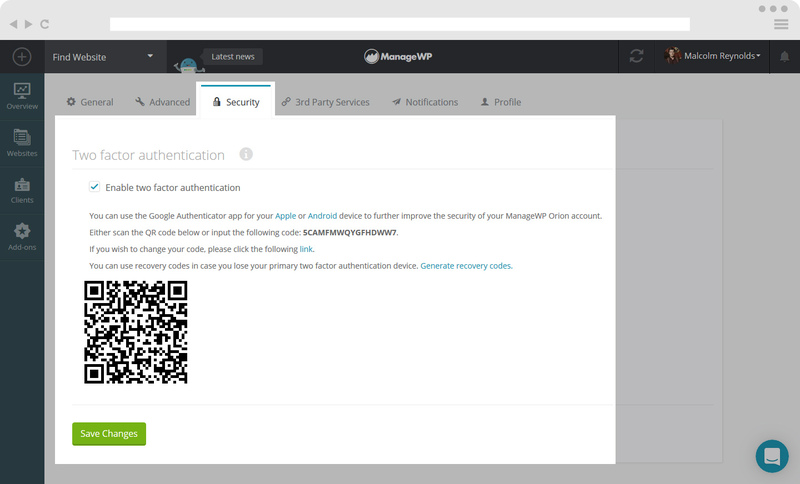 Then you’ll need to auto-generate a Google Authenticator passcode on your mobile device to log in to your ManageWP account. 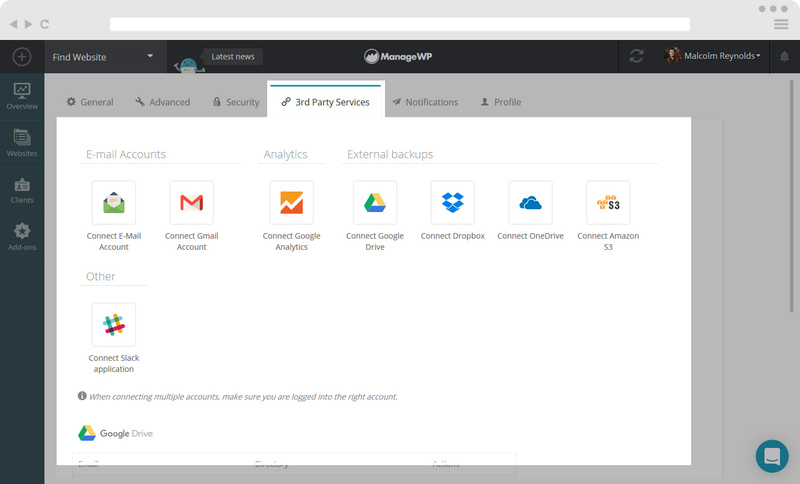 In order to connect 3rd Party Services to your account simply click the Connect to E-mail Account, Gmail Account, Google Analytics, Google Drive, Dropbox, OneDrive, Amazon S3 or Slack Button. 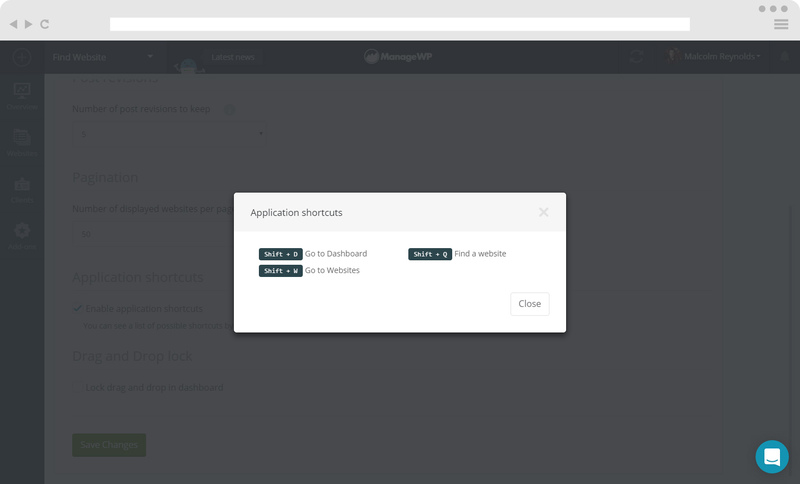 In order to keep you up to date and save you the bother of checking your dashboard every day, we implemented Product Digests and Event notifications. 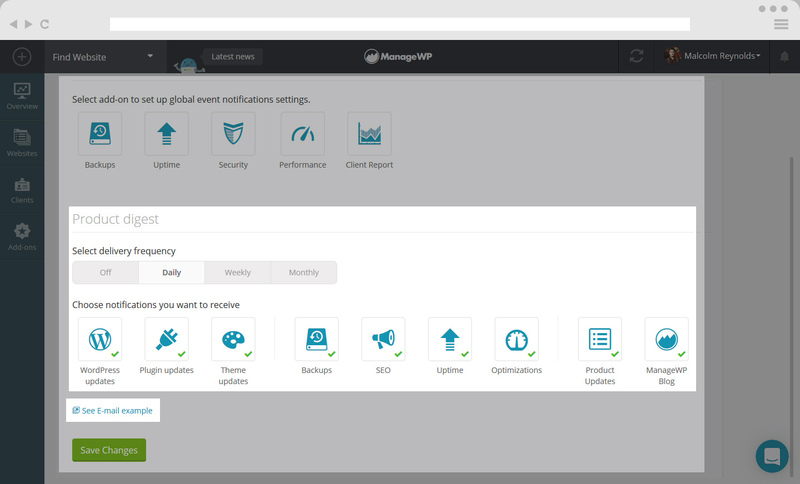 You are able to turn on Event Notifications for Backups, Uptime Monitor, Security Scan, Performance Check and Client Reports by clicking the icons under Event Notifications. By clicking on some Event Notifications you will see the pop up window, where you can set Notifications Settings for Admin, Collaborators and Clients. 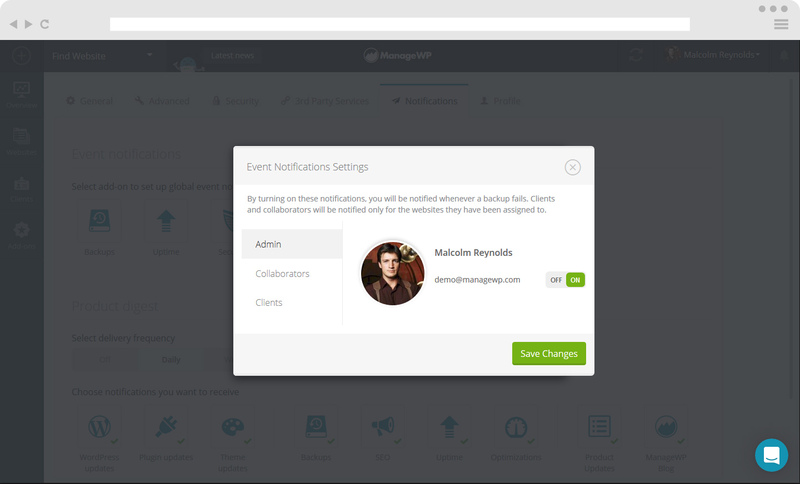 Right bellow the Event Notifications, you can select what you wish to include in your Product Digest, by checking the features. There is also a preview button, that let’s you preview your digest before saving changes. Here you are able to change your login and personal information. You can adjust your email and password, as well as first and last name. N.B Your Profile Picture is your Gravatar Image. Additional notification emails – If you wish to be notified on additional emails. 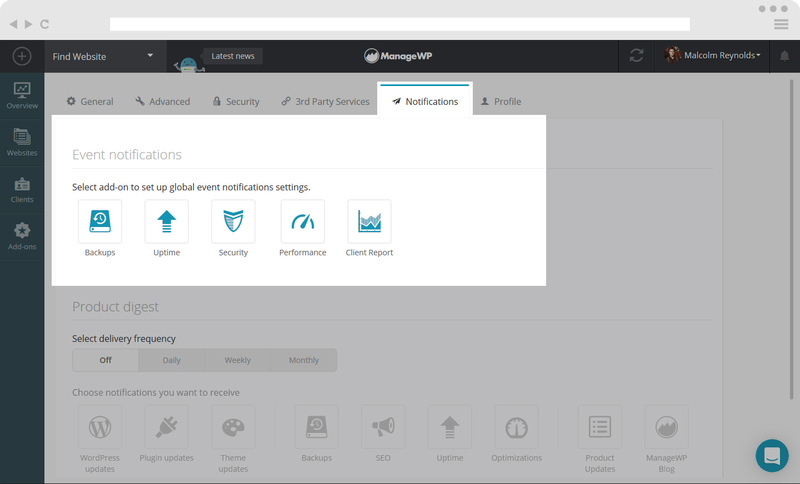 Webhook integrations – Get ManageWP event notifications directly in your app. 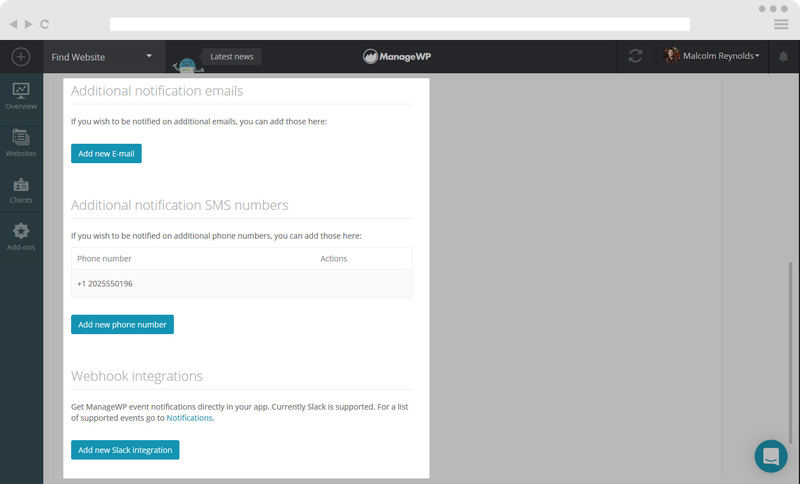 Currently Slack is supported. Import websites from Classic – If you want to copy websites that you have on your ManageWP Classic into Orion.